A new band arises from the blooming Canadian extreme metal scene. 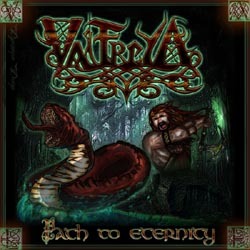 Valfreya were formed just in 2009 by their front-woman and main composer Crook. They are from Montreal and on 2010 they self-released the EP “First Chronicles”. On 2012 they signed on Maple Metal Records, who released their debut full-length “Path to Eternity” on February. Their music is often described as folk extreme Viking metal, but I believe it’s more precise to call them an epic symphonic black metal band with a few folk touches and a Viking attitude Anyway it doesn’t matter that much, since what actually counts in the end is the quality of the music. And Valfreya have released an amazing debut! “Path to Eternity” has 8 great compositions (plus an intro and outro) written by Crook before the formation of the band and it’s obvious she has worked them to perfection before their release. Their music is very melodic and variable. They move from symphonic fantasy metal, to epic Viking metal, folk metal and melodic black metal, including all the in-between genres. Valfreya merge these genres in every possible combination, being equally good in each of them. Crook is a really talented singer and her vocal canvas is unbelievable, ranging from fierce black metal screams to clean epic and operatic vocals. Unlike many singers of the genre, she is very correct in every style she sings and while her brutal screams are vicious and enraged, her clean vocals are so peacefully enchanting! The use of choir in many songs enhances the epic nature of their compositions and builds an even stronger atmosphere. Synths are really important in their music and the band owes a lot to Sharks’ keyboards, which have (together with the vocals) the basic role in the melodies. They also use some traditional instruments, like flutes, accordion and violoncello, so their orchestrations are very rich with a bombastic sound. The compositions are quite complex and difficult at times, but all band members seem to be very skilled musicians. Their lyrics are in English and inspired from Norse mythology. Valfreya is a band that exceeded my expectations! This debut album is wonderful and all fans of symphonic fantasy folk extreme metal better listen to it. It’s not only that all compositions are excellent, full of great melodies, but they also reveal the enthusiasm of a young band that seems to have much more to tell… I believe that they can still improve their production a bit, since this genre almost demands it. Of course for a debut effort their sound is more than decent! “Path to Eternity” is released by Maple Metal Records in a jewel case edition with 12-page booklet and you can check their music in their official webpages.